The longer days and shorter hemlines of the warmer weather invite time spent outdoors, and light meals prepared simply with the produce the season has to offer. In pursuing a craving for a distinctly summery dessert to accompany the unseasonably hot weather we've been having lately, I ambitiously went outside of season and inside my kitchen to bake a delicious key lime bundt cake in 30 degree heat! 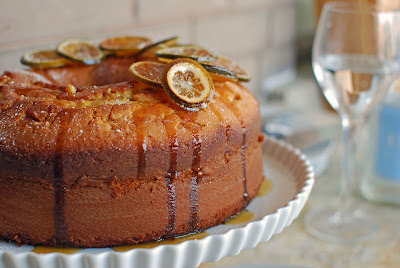 This cake is worth its weight in clothing removed - its dense and buttery crumb are lightly perfumed with key lime and topped with a zesty citrus and caramel glaze that is happily licked off any exposed skin it just 'happens' to land on. Key limes are tiny limes that pack a flavourful punch. They are sweeter than their larger cousins, the Persian lime: yellow when ripe, with a thinner rind. Their small size implies getting acquainted with your citrus juicer and tender palms from all the massaging. The juice is also available bottled, but I prefer being hands-on with my food. The key limes are massaged, halved, and juiced to yield just over a 1/2 cup of juice that flavours both the cake and the glaze. This cake borrows from the elements of a classic pound cake - plenty of butter, half a carton of eggs, cream cheese, sugar and vanilla. In addition to the vanilla and lime zest and juice, I added a half teaspoon of coconut extract to amp up the summery flavour profile. 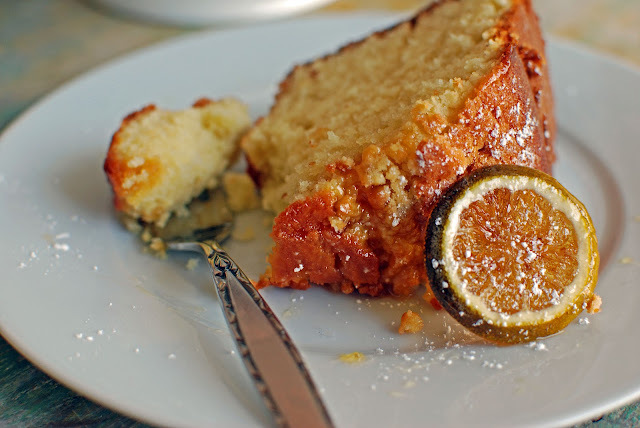 Many of the recipes I researched suggested using 7-Up or Sprite to add additional citrus flavour and aid in the rise and texture of the cake. I loved the idea of trying out the retro technique, but am not a fan of the chemical taste of soda pop. I wished to keep the cake's flavours natural, so I opted for an artisinal sparkling lemonade sweetened with cane sugar that I sourced from a local kitchen specialty goods store. 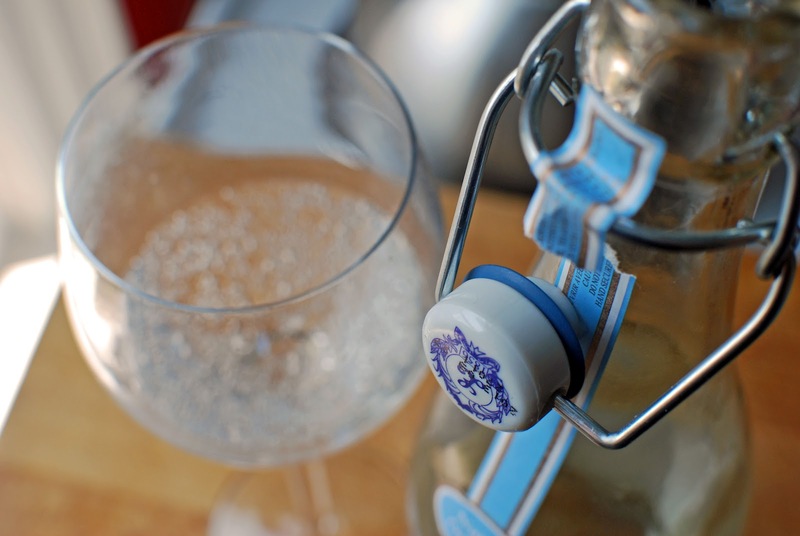 The sparkling lemonade was also the ideal beverage to enjoy with the completed cake. The batter is poured into a bundt or tube pan and baked in a 325 degree oven for about an hour until golden and passing the clean toothpick test. While the cake bakes, butter, sugar and key lime juice and heavy cream are set on the stove to caramelize. The cake is removed from its pan after a 10 minute rest and then carefully transferred to a cake plate. A toothpick is then used to puncture the surface of the still-warm cake and the key lime caramel glaze is poured over for the cake to indulgently soak up. 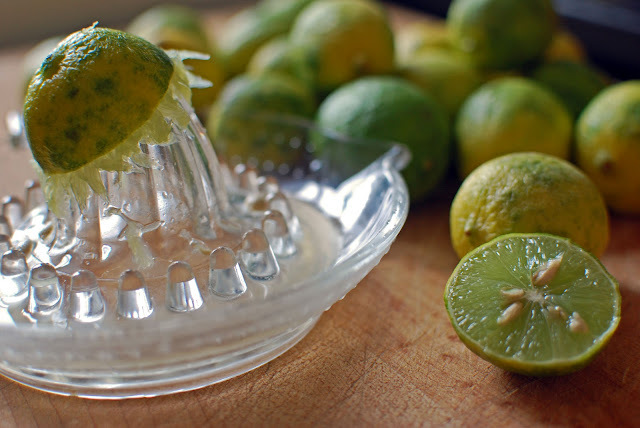 Fresh Persian limes are sliced, blanched in boiling water and candied in a sugar-water bath to use as decoration. The cake, golden and drunk on citrus-y caramel is topped with the candied limes and lightly sprinkled with a shower of confectioner's sugar. When sliced, the cake reveals a perfect, soft, dense and richly-flavoured crumb. This cake is ideal for summery picnics, bbqs, and eating in a state of déshabillé in a steamy kitchen on a hot day. Enjoy! In a stand mixer or using electric beaters, cream together butter and cream cheese. When fully blended, cream in sugar. On medium speed, add eggs one at a time, continuing to mix until each is fully incorporated. Add vanilla and coconut extracts and lime zest. Sift together dry ingredients, and combine lime juice and sparkling lemonade. Add to butter/sugar/egg mixture, alternating between dry and liquid ingredients until all is incorporated and batter is smooth. Pour batter into a greased and floured bundt or tube pan. Holding the pan level, let drop onto countertop to remove air bubbles. Bake in 325 F oven for about an hour, or until top is quite golden and a toothpick comes out clean. Let cool in pan for 10 minutes before carefully moving onto a cake plate. Using a toothpick, puncture the entire surface of the cake and pour glaze on top to let soak in. Melt butter, sugar and lime juice in a heavy-bottomed saucepan on medium-high heat. Allow to come to a boil and thicken. Add heavy cream, whisking to combine until the desired syrupy consistency is reached. Pour over punctured cake top. Decorate with candied limes (optional). Thinly slice the limes and allow to blanch in boiling water for approximately 2 minutes. Set water and sugar to boil in a saucepan and add blanched limes. Allow to simmer for 20 minutes. Carefully remove using tongs and set to cool on cooling rack until needed. Arrange on cake as desired. Your bundt cake looks so wonderful.. Yummy! jesus... how did I miss this one. And how has everybody else? This looks fantastic. 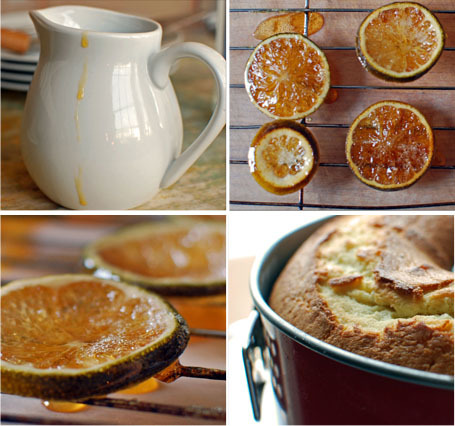 Great photos and recipe! I absolutely love lemon cakes. Thanks for posting your recipe. 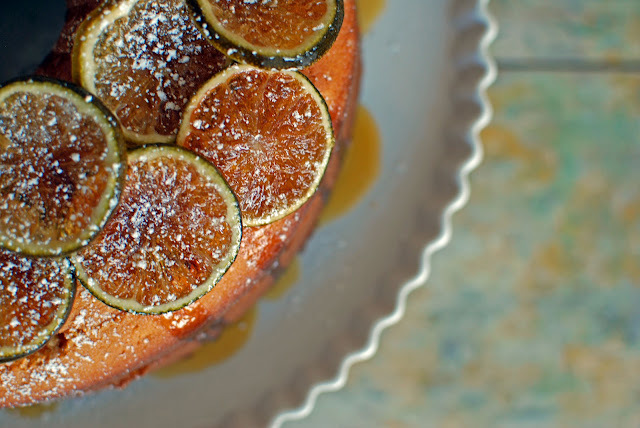 I think if I try making this cake I will use sprite for that extra bit citrus kick.